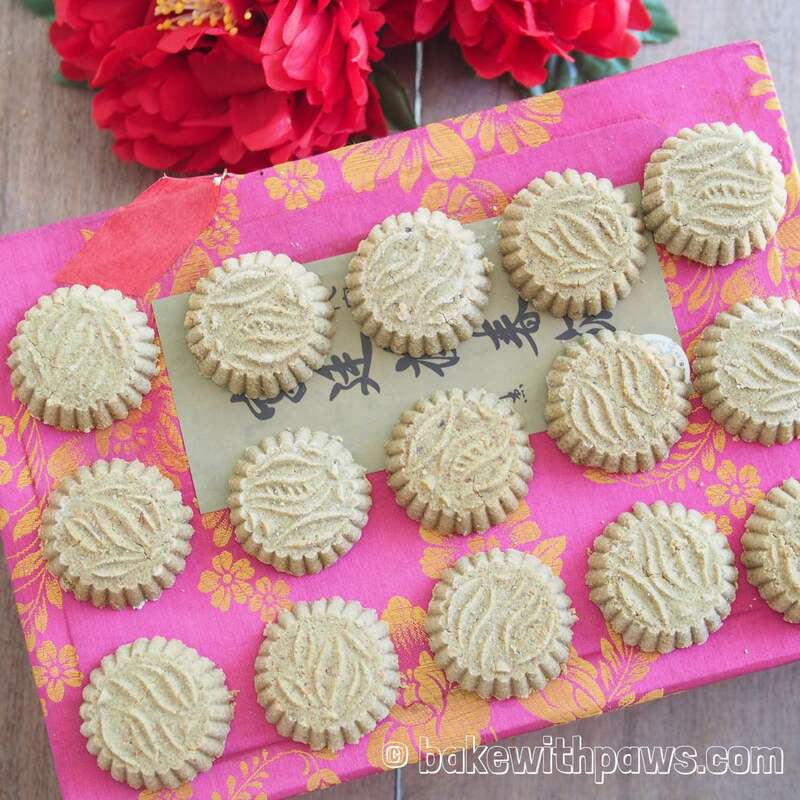 Chinese New Year is just around the corner and you can find Chinese Almond Cookies from Hong Kong or Macau at most Supermarkets. My mother in-law used to buy these for my late father in-law as it was one of his favourites. I like it too but the store bought version is rather sweet and uses lard or vegetable shortening. 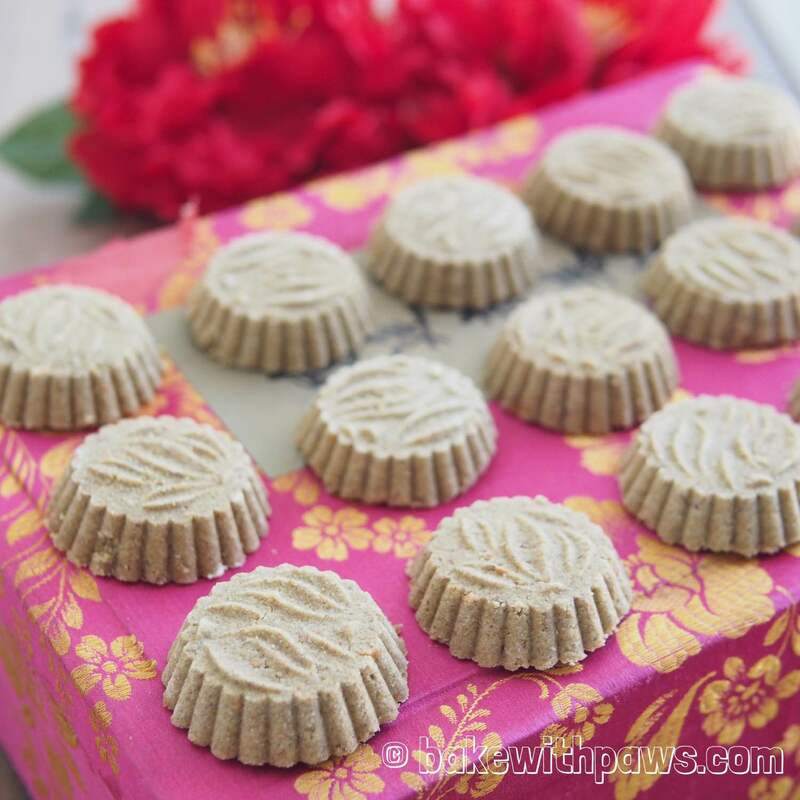 I came across a few recipes shared online and I found it quite simple and easy to prepare except you have to make your own mung bean flour if you can’t find the ready mung bean flour. I am lucky as I managed to get the green bean flour from one of the bakery ingredients stores here in KL. The original recipe asks for yellow mung bean flour. But, green mung bean flour works fine. But, you get a darker color. I made this healthier version of Macau Almond Cookies with less sugar and canola oil so everyone can eat it without any guilt. This is delicious cookie! Recipe adapted from Matcha Mochi and The Hong Kong Cookery with some modifications. Preheat the oven to 150C (top and bottom heat). 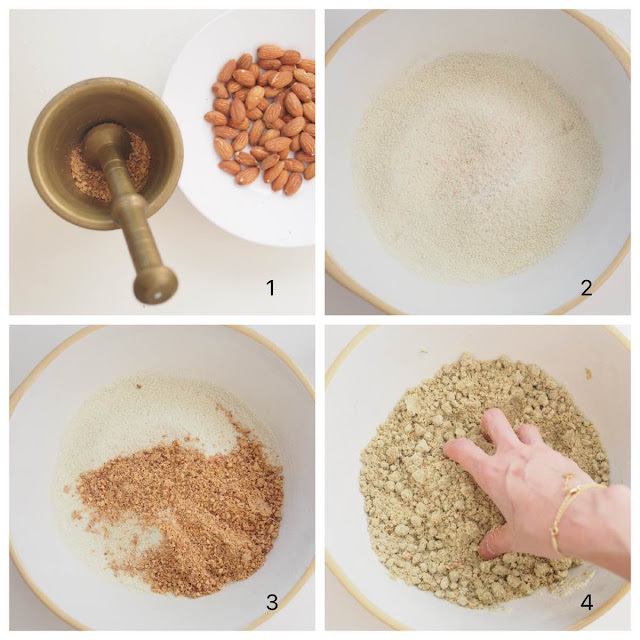 Crush the toasted almond with a pestle and mortar or with in a plastic bag with rolling pin. Set aside. In a big mixing bowl, mix mung bean flour, almond meal, icing sugar and salt together. Then add in the crushed almond and mix well. Add the canola oil and a teaspoon of water at a time. Use your fingertips to rub the mixture until it resemble bread crumbs. Add more water (1 teaspoon at a time) or oil if the mixture does not come together when press with your hand. Slightly dust the cookie mound with icing sugar. 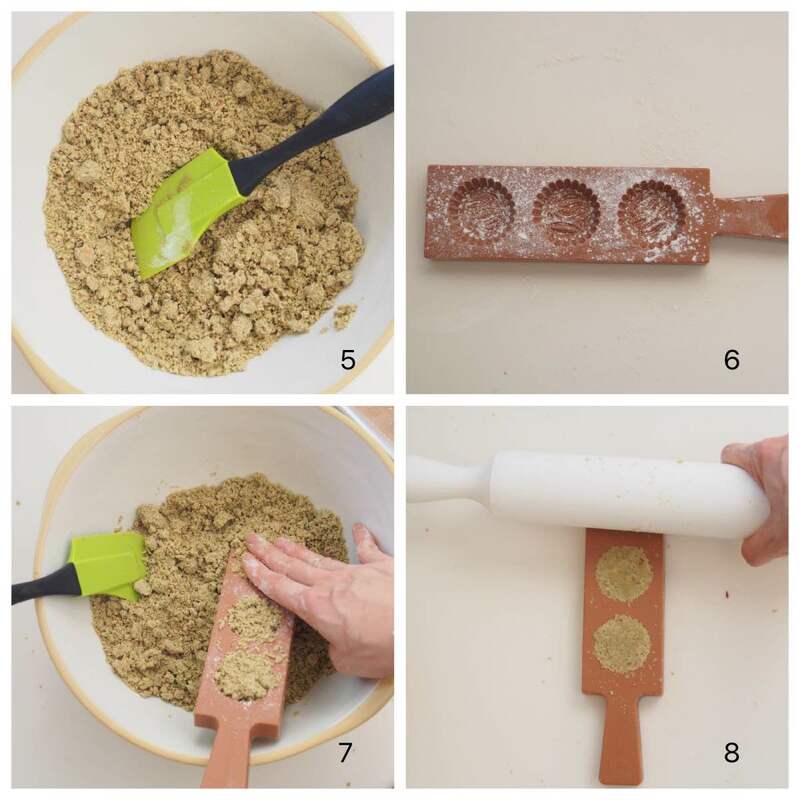 Fill the mixture into the cookie mould and press with your hand. Scrap off the excess mixture with a scrapper. Roll with a rolling pin to make it for compact. 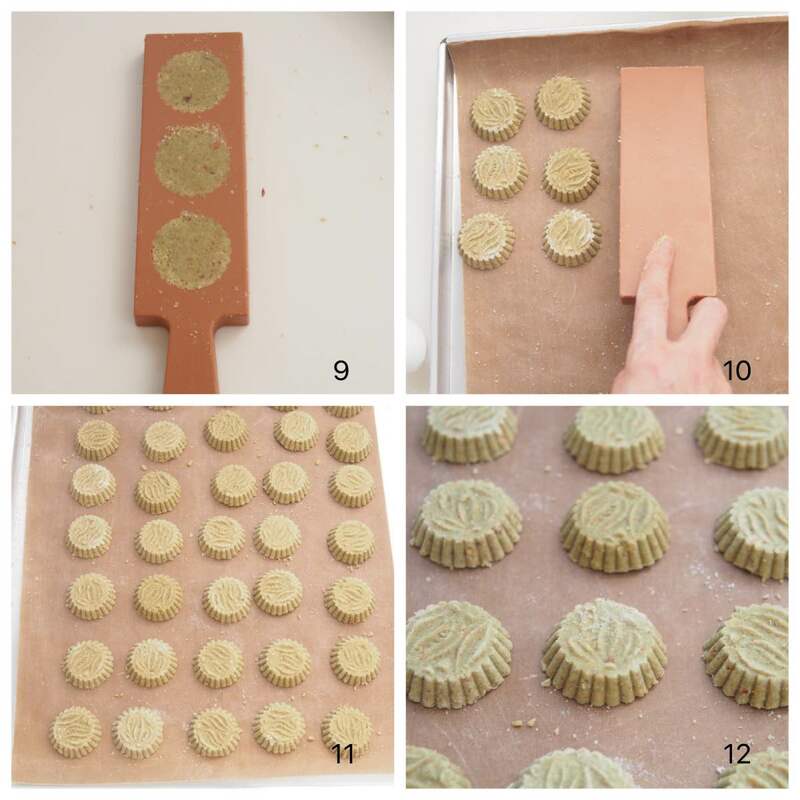 Knock out the cookies onto a table top or directly onto a lined baking tray. Bake at preheated oven for 30 minutes to 35 minutes. hi dear, may i know what type of green bean flour u using? can show me the packaging? tq! I got my green bean flour from House of Ingredients in Kepong. There is no brand on it. It is packed by the shop. If you can't find the store bought green bean flour, you can make your own mung bean flour.